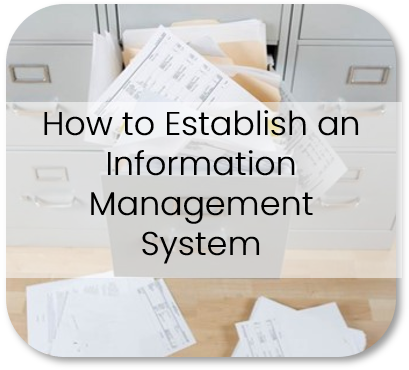 Information management is a key factor in clutter control. These days we’re bombarded with information from every direction. Despite the increasing trend toward digitization, paper remains a popular method for presenting and preserving information. Paper is one of the biggest culprits in the creation of clutter. ​It’s a daily battle to keep it all organized. If paper is threatening to overrun your space, do not despair! A number of steps can be taken to tackle the paper problem and put paper in its place. Avoid picking up fliers, brochures, programs, and so forth unnecessarily. Instead of bringing something home that is ultimately going to end up in the recycle bin, use your phone's camera to snap a picture. This way you have easy access to all of the pertinent information minus the paper. Respectfully decline when strangers on the street attempt to give you fliers or brochures. Instead of saving stacks of magazines or newspapers, go through them and tear out the articles you want to read/save. Recycle the rest. If you wish to save the articles scan them to your computer. If you haven’t read them yet, place them in a plastic snap folder and put them in your car to read when you are waiting (at the doctor/dentist office, at soccer practice, etc.). Opt-out of unsolicited mailings, email, and phone calls for five years by calling toll-free 1-888-5-OPT-OUT (1-888-567-8688) or visit www.optoutprescreen.com. You can also opt-out permanently at this website. Do so by returning the Permanent Opt-Out Election form which you will receive after you initiate the process online. This is just one method for opting out. A quick Google search will reveal numerous others. Whenever possible, limit paper clutter by going digital. If you haven’t already done so, request digital copies of bills and bank statements. You will receive notification by email when the documents become available. If you’re worried about forgetting to pay things, you can always have payments automatically withdrawn from your account. If you're uncomfortable with this option, you can simply set up reminders in your phone so you don't forget. Limit what you print. For instance, instead of printing emails, file them electronically for future reference. Instead of filing reference materials in a filing cabinet, consider scanning items and saving them electronically. Good candidates include magazine articles, newspaper clippings, political or other cartoons, and informational handouts or brochures. Some stores now allow you to request an email receipt in place of a paper receipt. When your email receipt arrives, archive it electronically. Whenever possible, request information digitally. Things to look for in digital format include children’s report cards, newsletters (school, church, community, or other groups), restaurant/take-out menus, coupons, warranty information, instruction manuals – just about anything! 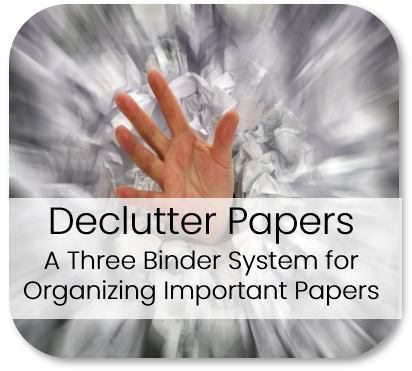 For more tips on controlling paper clutter, check out these resources.